Click here for a summary of the global tentative agreement. Early this morning a tentative agreement (TA) was reached with the formerly "Alliance" New York City hospitals of Mount Sinai, Mount Sinai West, St. Luke's, New York Presbyterian, and Montefiore. The TA includes a $100 million commitment for additional staffing, allowing for hundreds of additional nurses to be hired in these hospitals. • Enforceable Staffing Ratios: We have finally achieved the goal of having staffing ratios spelled out in the contract with a meaningful enforcement mechanism. This sets a standard not just for New York, but for the nation. • Four Year Agreement: Our agreement ensures staffing, security, and strength for the next four years, expiring Dec. 31, 2022. • Industry Leading Wage Increases: With minimum wage increases of three percent (3%) in each year of the contract including retro, we have secured industry leading wages for our profession. • Retiree Health Benefits: For all facilities, we were able to achieve benefits, allowing members to maintain health benefits after early retirement (subject to key conditions). Several other agreements were reached on priority issues at the local bargaining tables. This agreement was only achieved through the unity of thousands of nurses, exercising our power to win for our patients, our communities, and ourselves. This agreement is subject to ratification. Stay tuned for the official ratification vote schedule at all hospitals. Please feel free to print out this leaflet to distribute. Today, with a new NYC based neutral mediator brought in emergently, management made an opening proposal on staffing. Thanks to you, our unity and strength forced management to make the following opening proposal with a proviso that we postpone our strike notice to give them more time. They chose not to fund the replacement staffing agencies and instead committed to putting that money toward additional staffing that will be reflected in our contract. INCREDIBLE EVIDENCE OF MEMBER POWER. We remain committed to communicating your strength and priorities. 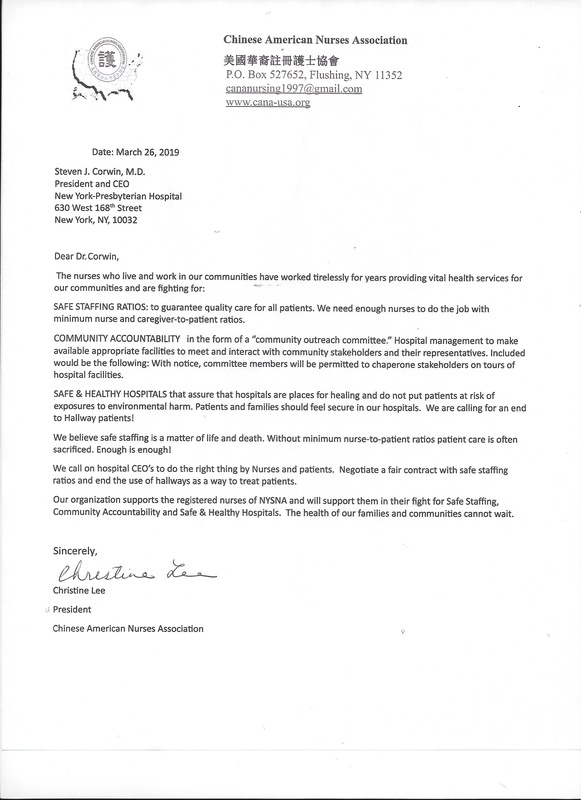 NYSNA RNs at Mount Sinai, Montefiore and New York Presbyterian Hospital Systems announced an April 2nd strike date and the offical '10-day' notice of intent to strike has been delivered. Hospitals refuse to hire enough bedside caregivers forcing nurses to care for up to 19 patients at once. When this happens, our patients suffer. We are patient advocates and we are raising a red flag. We do NOT want to strike, but are determined to make changes that will guarantee SAFE STAFFING to take care of our patients. Safe staffing saves lives. This is a matter of life or death. Nurses refuse to be silent despite the hospital systems' attempts to stop us from expressing our views and their failure to provide us basic staffing information. More than 97 percent of nurses across the three hospital systems voted earlier this month to authorize a strike. Registered nurses overwhelmingly vote to authorize a strike affecting more than 10,000 registered nurses in New York City at three hospital systems: Mt. Sinai, Presbyterian and Montefiore. Last month, reports were released documenting approximately 3,800 “Protests of Assignment” signed by over 20,000 nurses in 2018 alone from the three hospital systems. The reports detailed conditions inside the facilities and showed there aren’t enough nurses to give patients the care they need and deserve. Additional news reports clearly highlighted disturbing conditions, including patients left on stretchers in hallways for days at a time with no privacy because of a lack of staff and space. Hospital management has not addressed any of these issues. Instead, management has denied us the information we need to fight for the nurses and patients at the bargaining table, refused to bargain over key issues, and attempted to silence nurses who are advocating for their patients. Health & Safety; Insufficient # of Staff & High Acuity: Pediatric ED understaffed such that there is more than a 3.5 to 6 hour wait time to see a provider, more than 20 patients holding in triage area, no RN screener, patients pulling out IV and multiple attempts to bite, kick, scratch, and punch staff. Census 68, only 6 RNs. High Patient Acuity, Insufficient # Qualified Staff, Violation of Staffing Ratios: On NICU, we have 2 orientee RNs, and 2 CPAP baby, 4 CPAP babies with IV and ABTs, 3 babies with IV antibiotic and glucose checks every 3 hours. Our bed capacity is 35 and we are over with a census of 44. Only 3 RNs on duty. Parents need personal attention/education. Insufficient # of Staff, High Acuity: Unit census was 21 at start of shift with 2 admissions to be received. Now census is 26 with an additional 2 patients en route. A total of 11 admissions will be received on this shift. No CNAs on floor. 1 ventilated patient, 2 with trach, 1 on restraints, 3 isolations, multiple incontinent patients, 3 pressure ulcers, 1 blood transfusion, all call bells ringing but nurses are busy with admissions, over 20 patients on fall risk. Health and Safety: Insufficient space, hallway patients, patients stacked in rows, unable to access patients in a timely manner, temp in ED 76 degrees on west side, air conditioning not working on East side and area is very hot and uncomfortable, inadequate ventilation, unable to comply with appropriate infection control. Patients waiting days to get a bed and aggressive to staff. Nurse are also proudly joining the chorus of healthcare workers, public health officials, and others calling for a stop to budget cuts to critical healthcare needs, including Medicaid and other funding for people in need. To support nurses in this struggle, and for the most up to date information, call: 844-82-NYSNA. BY HUGE MARGIN, NURSES ACROSS NYC AUTHORIZE A STRIKE! NURSES ARE READY TO TAKE ACTION TO DEFEND OUR PATIENTS, OUR COMMUNITY, AND OUR PRACTICE. It's impossible to capture in a single post the extraordinary impact of what New York nurses were able to pull off. We picketed thirteen hospital sites from Bronx to Brooklyn, representing 13,000 registered nurses. Our message was clear: management needs to bargain in good faith to provide our community with the care our patients deserve. Special thanks to our labor, community, and elected leaders who came out in solidarity, including: New York State AFL-CIO, New York City Central Labor Council, AFL-CIO several locals of CWA District 1, Retail, Wholesale and Department Store Union (RWDSU), Hotel Trades Council, District Council 1707, AFSCME, 1199SEIU United Healthcare Workers East, New York Teamsters, New York Professional Nurses Union, Amalgamated Transit Union (ATU), OPEIU - Office and Professional Employees International Union, GABRIELA USA, Northwest Bronx Community & Clergy Coalition, Karines Reyes, Jumaane D. Williams, Brian Barnwell, Assemblymember Mathylde Frontus, Laurie Cumbo, Rory Lancman, Assemblyman Jeffrey Dinowitz, Assemblywoman Maritza Davila, Michael Blake, Assemblywoman Nathalia Fernandez, Thomas P. DiNapoli, Council Member Andrew Cohen, Council Member Francisco Moya, Eric Adams, Kirsten John Foy and several others that we inadvertently must have missed. Without our allies, this isn't possible. Take a look though our photo album and appreciate all these bright, beautiful faces! We received coverage from virtually every local news outlet throughout the five boroughs. Check out a sample of the stories below. Watch TV Coverage from Good Day New York, News 12 Brooklyn, Pix 11, WMBC, Spectrum NY1, and Listen to Radio Coverage from 1010 WINS. The linked document was presented to all Alliance Hospitals, although similar common demands are being presented at all NYC hospitals in negotiations. What does RESPECT mean to these nurses? Read the latest Update HERE! Watch how NYSNA's Montefiore Bargaining Committee prepares to make contract presentations to management. We are placing patients first. Watch and learn about NYP bargaining efforts from nurses and organizers. Watch members from Mt. Sinai Hospital negotiate for a better contract. Sign the pledge to join an informational picket on February 13th outside of your facility!